Trinity Church Cheltenham held its annual carol service at The Centaur on Cheltenham Racecourse. The event attracted over 2000 people with Production:av having the pleasure of supplying the projection and video system for the event. 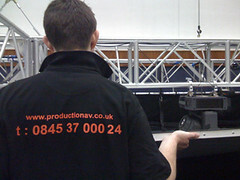 We provided a full HD projection system using our Barco HD8 projector, onto a 6m wide screen. 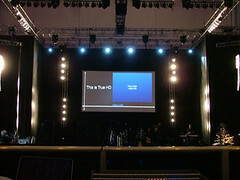 Sources were mixed with the Barco Screen PROII, showing true HD presentations using Keynote, mixed camera images, with the song words keyed over the top of the camera images when required. The event was a success, and continues the relationship Production:av has with Trinity Cheltenham, which started as one of the companies first clients in 2005.